In light of the terrifying events in Paris yesterday, like the rest of the world I have been struggling with how to respond. I have deep ties to Paris, both personal and familial, and 2015 has been one of the city’s most terror-filled years in recent memory. Though all of my friends and relatives have responded to my inquiries and are, thankfully, unhurt, there are 127 families today who cannot say the same. The best way I can think of to fight the fear and shock of yesterday is to reiterate the love I have for Paris, and to tell of some of the wonderful cinematic moments that the city has given me. In 2011, I spent 6 months in Paris as a student at the Institut Catholique de Paris. I was very excited to be there, but I wondered how I was going to get through 6 months with only the classic movies I had brought with me. I had managed to find a French version of Hold Back the Dawn (of all movies) at the DVD store in the Carrousel du Louvre, but other than that I was operating with the slim pickings that I could fit in my suitcase. On my first day of class, my keen classic movie ear overheard a student talking about Casablanca across the room. I went over to contribute to the conversation, and the student mentioned that he had seen it in a theater in the 6th arrondissement and that this theater shows classic movies every night. Every night! He happened to have a flyer with him, and he gave it to me and told me I should check it out. Well, check it out I did. That evening. Upon my arrival, I discovered that the theater in question was the Action Christine, tucked away on the tiny rue Christine near the Odéon metro stop. It has been a theater specializing in classic Hollywood since 1973, and is located inside a historic building with a carriage entrance from the 1600s. I was in love. The movie they were playing that night was My Man Godfrey, and when I went to the ticket window, the woman on duty asked my age. I was 25 at the time, and the woman told me that guests under 26 get in for only 3 euros. So I filled out an application with some ID proving my age, and I got a discount card that let me in the theater for only 3 euros, each time I decided to come to the movies. Needless to say, with a 3 euro price tag, I went nearly every evening. At the rue Christine I saw All About Eve, Tobacco Road, Leave Her to Heaven, It Happened One Night, Gentlemen Prefer Blondes, A Star is Born, Mildred Pierce, and countless others. It became my ritual after school to head east on the metro and get off at Odéon, sometimes get a frozen yogurt up the street and then go to the Action Christine. Shortly thereafter, I saw a flyer at the Action Christine advertising a movie theater on the rue de l’École de Medecine, just up the street. The next day, I went to check it out and it was another Action theater, also playing Hollywood classics! This one was called the Action Desperado, located just a few blocks from the school of medicine, after which the street was named. 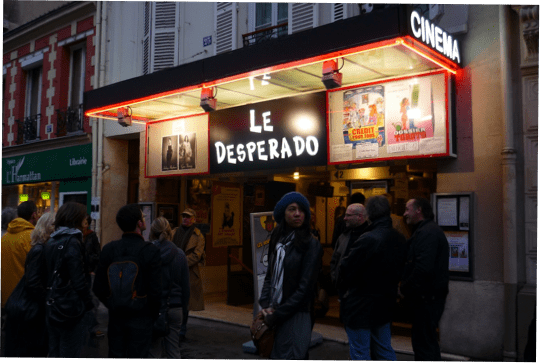 For the rest of my time in Paris, I kept schedules for both the Action Christine and the Action Desperado displayed prominently in my apartment. Sitting in those tiny, darkened theaters, watching “my people” on the screen, I felt so happy and joy-filled that I couldn’t stay away. I started to get homesick around month 4, and I credit the classic movies at the Action Christine and Action Desperado for giving me that dose of home that I so desperately needed. Today, the theaters still run the classics. Glancing at the schedule for the Action Christine (now called Christine 21, as the owners have changed), there seems to be a Marilyn Monroe theme today, with The Misfits, All About Eve, The Seven Year Itch, and Bus Stop playing in those two tiny theaters that I know so well. They’re also having showings of Bringing Up Baby, The Scarlet Empress, Duck Soup, and The Informer. On some of the darkest days of our history, movies have had the power to lift us up and carry us to a different, more decent world. So if you’re in Paris today, on a day when you can expect to be overwhelmed with grief, sadness, and tragedy, go to one of these theaters and be transported, while at the same time giving love and support to one of the hidden cinematic treasures of the beautiful city that is Paris. This entry was posted in Lara Gabrielle Fowler and tagged action desperado, classic movies, odeon, paris, rue christine. Bookmark the permalink. Lara, your love for classic movies and Paris just emanates from this article, and it’s wonderful. What fun to have those theatres — I wish we had something like that where I live. I would be living in them too! Fantastic tribute. One of the best articles I’ve ever read and so absolutely true.